Science Notebook—How do students record qualitative, quantitative, and sensory data? Measure Time and Date—What are the different ways to record the time and date? Estimate the Numbers of Animals in a Group—How can we accurately use estimation to determine the number of animals in a group? Take Measurements and Estimate Size—How can we use actual and estimated size to identify an animal? Focusing on an Animal—What is it like to be an animal? Use Your Senses—How do animals use their senses to survive? WANTED Poster—What are unique traits of different animals (or plants)? Read and Use Maps—How do we know where we are? Use Data to Answer Questions—How can data be used to answer questions? 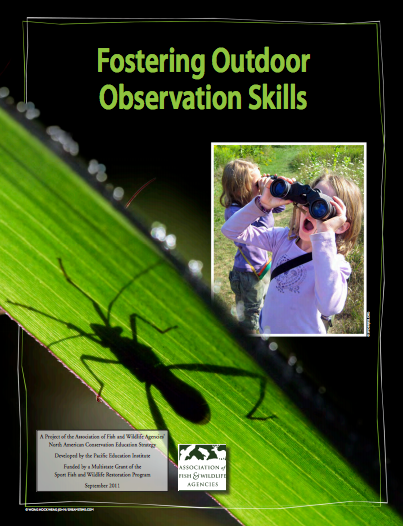 This handbook is a great addition to The Field Investigation Guide. This entry was posted in biology, elementary, high school, middle school, teaching, Washington State Science. Bookmark the permalink.